You are here: Home » PARTY, PARTY, PARTY! 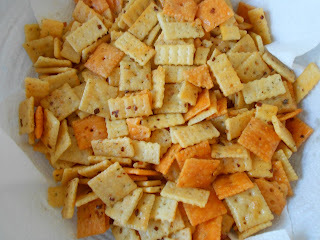 These are the easiest and most addictive little crackers I have EVER made. I rue the day I came across this recipe on Pinterest because they are now made frequently in the Blackburn household. A collection of Cheese-its, baby saltines and Mini Club crackers coated with a ranch, red pepper flavoring, we constantly find ourselves grabbing handfuls of them. On a side note, be sure to let these crackers sit for a minimum of 24 hours before serving them. The more they can soak up the oil. These bad boys are so awesome that they are addictin’! 1) Combine crackers in a large bowl. 2) Complete ranch dressing, oil and pepper in a second smaller bowl. Pour over crackers and stir to coat. 3) Place in a gallon sized Ziploc bag and turn periodically for a 24 hour period.